grows very large in magnitude) can be determined by the structure of the function's expression. 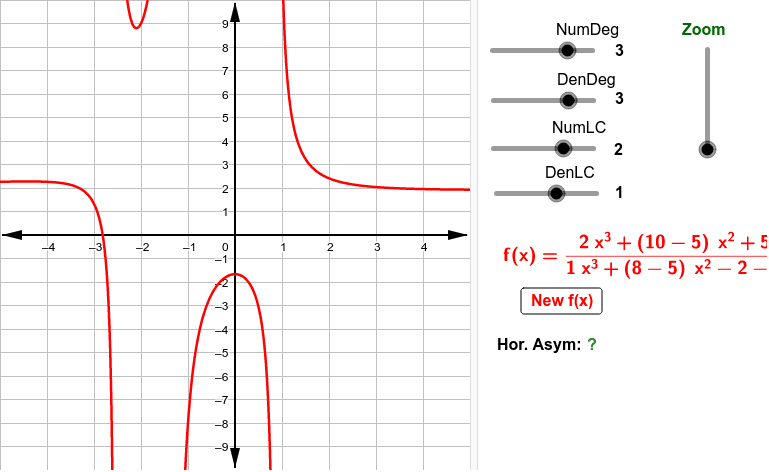 This app demonstrate the three basic cases of horizontal or oblique (slant) asymptote based on the relative degrees of the numerator and denominator polynomials, and their leading coefficients. The degrees and the leading coefficients of the numerator and denominator polynomials can be set with the four horizontal sliders. Each time a change is made to one of these, a new random function is generated. New functions can also be randomly generated using current slider settings by clicking the New f(x) button. scales are changed simultaneously to maintain the proper aspect ratio of the display.